Part of the Perth Mint's sought-after Lunar II series, the brand new Year of the Rooster (2017) 1/2 oz silver bullion coin will be launched on 12th September 2016. 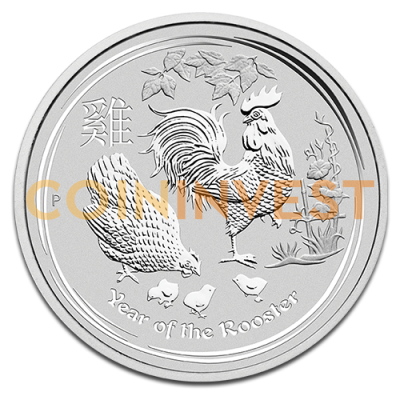 Buy 2017 1/2 oz silver Roosters from CoinInvest.com to add value to your portfolio or purchase them as a great way to mark a special occasion. The affordable 1/2 oz coin is the smallest in the Lunar II Silver series. Tom Vaughan's 2017 design shows a rooster with his hen and chicks surrounded by a radial patterned edge. Every coin is inscribed with the artist's initials, 'TV' and also with the Pinyin pictograph meaning 'rooster' and 'Year of the Rooster'. The obverse bears the famous Ian Rank-Broadley portrait of HM Queen Elizabeth II. Why buy silver 1/2 oz Rooster coins online from CoinInvest.com? CoinInvest is one of Europe's foremost online dealers in bullion coins. Our ability to buy in bulk enables us to offer our customers unique investment opportunities, like the silver 1/2 oz 2017 Year of the Rooster coin from the Lunar II bullion series, at the most competitive prices.